The AGH1000 is connected between the Wii’s video output and the TV or monitor’s video input. The Wii’s video output format is NTSC Composite Video. This means that all the information to properly drive a video monitor is present on a single wire – typically the yellow RCA connector. 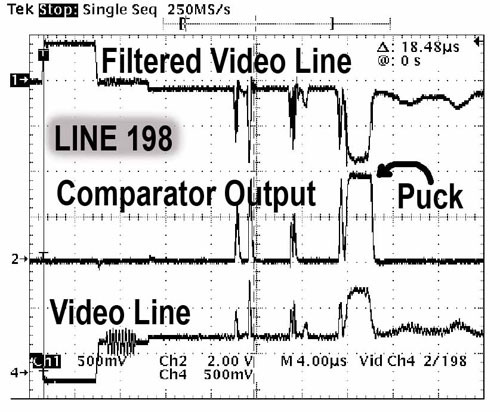 We used this composite video signal to generate signals that electrically press the correct notes and strum button at the correct time. 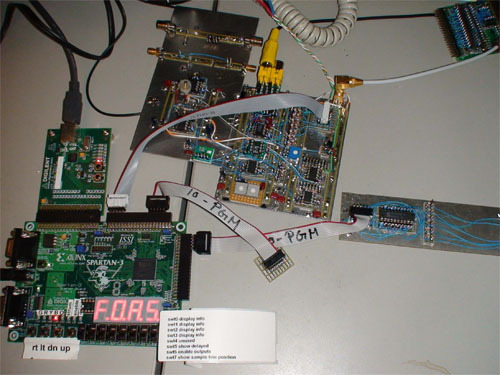 The system consists of four sections – the Analog Processing Board, the Digital Processing Board, the Driver Board, and the Opto-Isolator Board. Cheats like this are undetectable to the console…from the perspective of the code inside the console, he’s hacked The Matrix. He’s posted videos of it working, schematics, and source code (VHDL oh noes! I loves mah verilog). Thanks for sharing Michael! I get a hankering to do something like this every time I play Tetris at level 5 against the game AI on my DS (or when i play caustik). Someday, when I have spare time (…), I want gut a DS and put a frame buffer scraper on it and wire up its buttons to the GPIOs of a chumby. Actually, I want to hack up two of these, and configure them to play head to head. Then, people can submit AI engines for each hacked Tetris DS controller and we can have dueling user-submitted Tetris AIs. 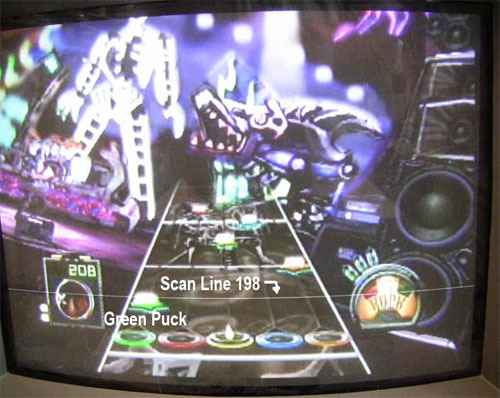 Using the DSes as the intermediate for the head-to-head game ensures that you are obeying “regulation” DS rules (how fast pieces can be turned, dropped, and order of piece generation) and running the image recognizing game AI on chumbys would put a limit on how much CPU and memory resources you can have. That might be the only way I could beat caustik at some form of Tetris…actually, nah, I think caustik could write a better AI engine than I can, come to think of it. Thanks to roastbeef for the link! This entry was posted on Wednesday, April 23rd, 2008 at 3:06 pm and is filed under Hacking. You can follow any responses to this entry through the RSS 2.0 feed. Both comments and pings are currently closed. After having similar experiences with my kids I thought of doing something similar. My idea was to go a little more low-tech and have suction cup sensors that would stick on the screen and utilize simple optical sensing to trigger the buttons. His solution is way more cool! Hahaha, this is sooooooooo cool! familiar with the guitar heronoid? I love this board game.